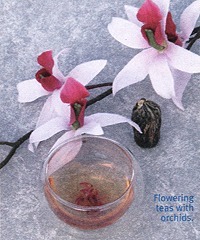 This article is from the Tea & Coffee Trade Journal (Nov '08). This publication contains many interesting articles on both tea and coffee. It is a great place to learn about tea and the growing regions. Performance teas, also known as blooming teas, flowering teas, blossoming teas or art teas have begun to take the specialty tea industry by storm. Though still a small player, these hand-tied works of drinkable art are fast becoming a crossover product appealing to both loose tea veterans as well as teabag consumers. Those familiar with the flavor and aroma nuances that can be found in loose leaf teas are eager to explore the new twist on their traditional brew. Novices gawk at the strange shapes and are entranced as the leaves blossom open to reveal their hidden surprises. Despite their visual appeal the little bundles are more than just ornamental. Actually, these artful combinations of tea leaves, or in some cases only buds, with various flowers have been produced for nearly two decades. Hand-tied shapes of tea leaves alone go back even farther. 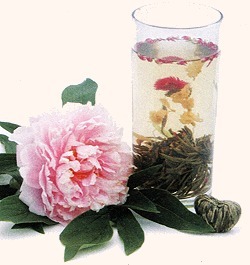 Green Peony (Lu Mudan) and Green Lichee (Lu Lizi) were some of the first products of this kind. Green Peony consists of a bundle of green tea leaves, tied around the center and then flattened by hand to resemble a flower. For Green Lichee, the bundle is tied around the base of the leaves and the loose ends folded down and under until they resemble a lychee-sized sphere. About 15 years ago a single chrysanthemum flower was sewn to the top of the peony shape. Chrysanthemum had been drunk for centuries and is a staple in traditional Chinese medicine. When infused, the flavor from the tea leaves and the blossom combine. In short order more chrysanthemums were sewn together and then enclosed beneath the top layer of leaves. Called brocade of flowers or jinshang tianhua in Chinese, the first of these performance teas titillated the drinker with a slowly unfolding show, which concluded with three flowers suspended in a vertical column above the tea leaves. Originating in the Yellow Mountain area of Anhui Province, a place already famous for exceptional tea, the idea quickly caught on and production workshops were set up in Fujian Province, especially Fuding city, the home of silver needle and jasmine teas. Flowers such as plum blossom buds, lily, jasmine, osmanthus and others were tied into various shapes and given poetic names like treasure of the sea and snow lotus. One delightful creation is golden treasure, a mix of jasmine buds and clover-like globe amaranth, which circle above the blossom of tealeaves like a halo. In some cases it is not the green leaves but rather the tender buds that are used to form these fanciful creations. These buds often fall into the category of white tea rather than green and have more delicate flavors and aromas that complement the flowers. In contrast to the pale liquor of white teas and made to appeal to the palates of western drinkers, black tea leaves and buds are now being used as well. Workshops and tea-artists that develop new shapes maintain patents on their designs and closely guard the secret methods of manufacture. 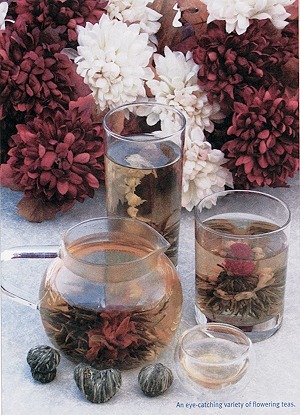 Generally speaking, the tea leaves are first withered and then the flowers are introduced. The shapes are tied, formed by hand and then dried to seal in the flavor. Depending on the design, one piece requires about 10 grams (.32 oz) of fresh leaf. The work can be done by a single person but larger factories may divide the job according to the different steps. On average it takes about three hours to make one kilo. Tedious work to be sure, there are around 20 factories in Fuding alone, 10 of which produce the major share. Their combined annual production for export is between 80 and 100 tons. Around 15% of the total production goes to the domestic China market. Customers placing large orders need to specify their quantity in the spring to ensure availability of the raw materials. There are perhaps a dozen or more other production centers across China with new workshops emerging all the time. The popularity of this growing product line is evident at tea and coffee trade shows, where several vendors allocate significant parts of their booth for displaying the many designs. And, with new and surprising creations being developed all the time, perhaps traditional ceramic pots of tea will be nudged over a little to make more room for clear glass tea pots full of vibrantly colored, flowery spectacles of tea.